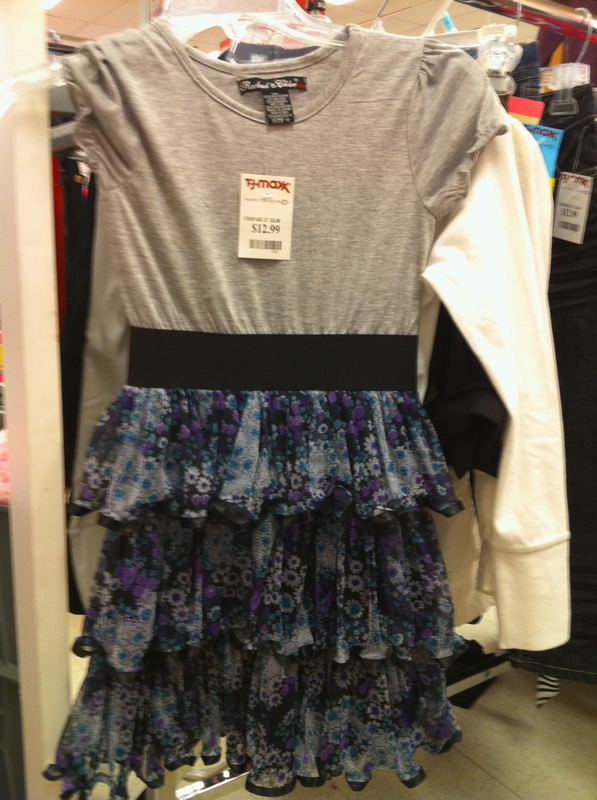 One of my favorite sewing challenges is to copy ready-to-wear, so when DD Angela told me that Caitlin wanted a dress with a T-shirt top and a ruffly skirt, I visited the store where she’d seen the dress and of course, surreptitiously took a photo. This didn’t seem to difficult. Before I go further, I should mention that while this tutorial is for making a child’s dress, the same technique would work for an adult. In fact, here’s a similar idea for a summer dress – this was in a storefront when we were in Greece last spring. It’s still on my list of things to make someday. Instead of sewing a t-shirt for the dress, I happened to find a cute one on the sale rack. In the eyes of a child, I am sure it was far cuter than anything I would make, as it had massive amounts of glitter. 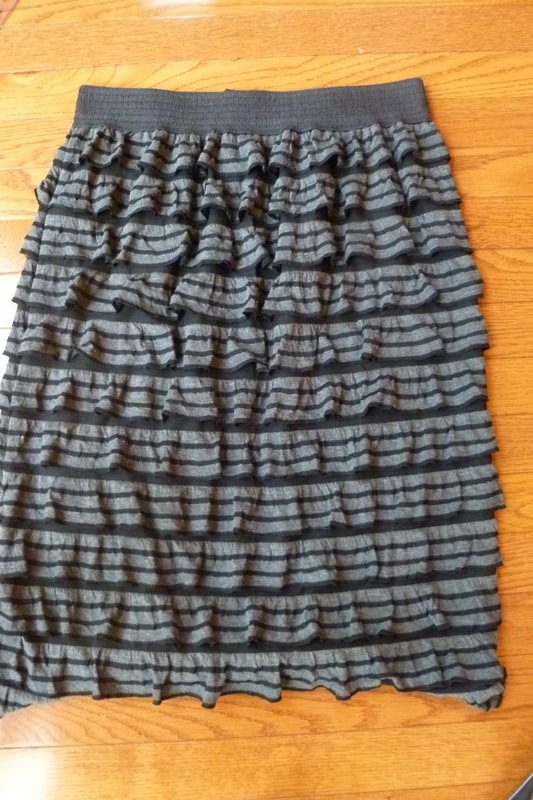 Now that I had the t-shirt, my next stop was the fabric store where I purchased 2″ black twill elastic and 1/4″ green ribbon for the skirt. The lace for the skirt was left over from a previous project. 1. 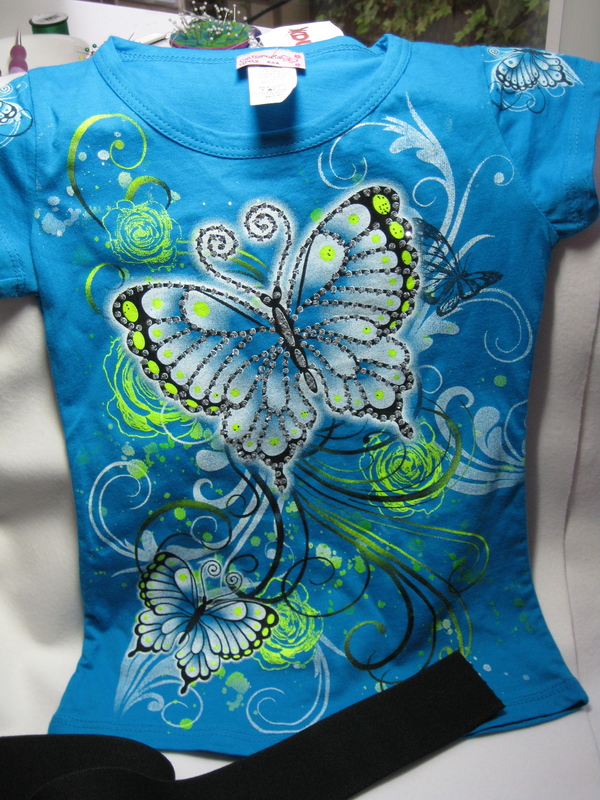 If you’re using a purchased t-shirt, it is best to use a fitted style, as opposed to the standard boxy t-shirt. If not, taper the sides so it is somewhat fitted. 2. 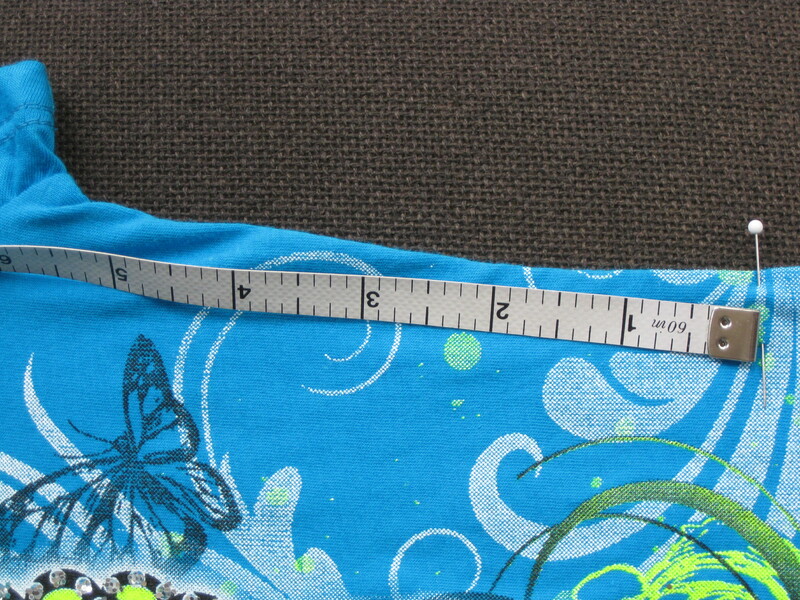 Measure the length you’ll need for the sides of the top of the dress. In this case, for a size 5, I aimed for 6″ on each side. Cut the t-shirt off at this point, making sure to keep the bottom seam even. 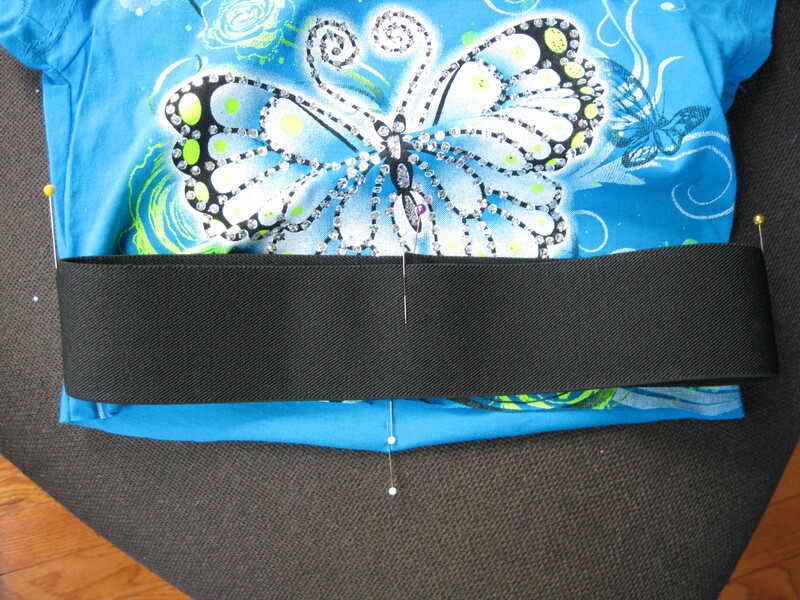 I find that it’s easier to hold the side seams together while cutting as the bottom cut will be more even. 3. 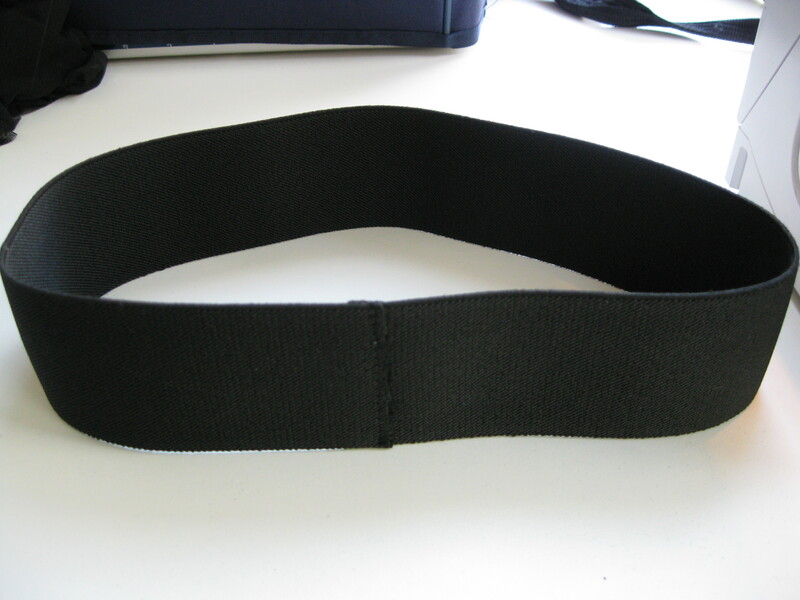 Now measure a length of elastic – about 1-2″ longer than the child’s waist, plus 1″ for the overlap. I used a length of 24″. This should also be the approximate circumference of the shirt. 4. 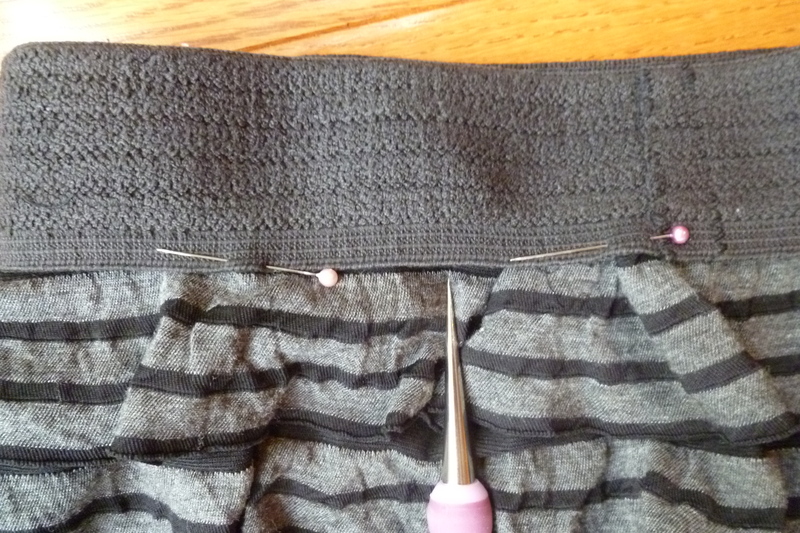 Overlap the elastic about 1/2 inch and sew together with a zig-zag or straight stitch. 5. 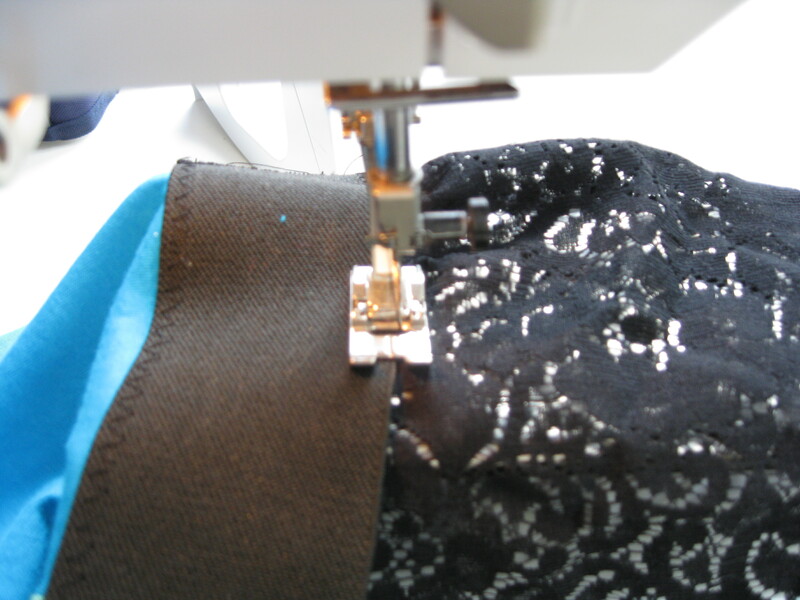 Mark the center front and back, and the sides on the elastic with chalk or pins. 6. Also mark the center front and back on the shirt. 7. 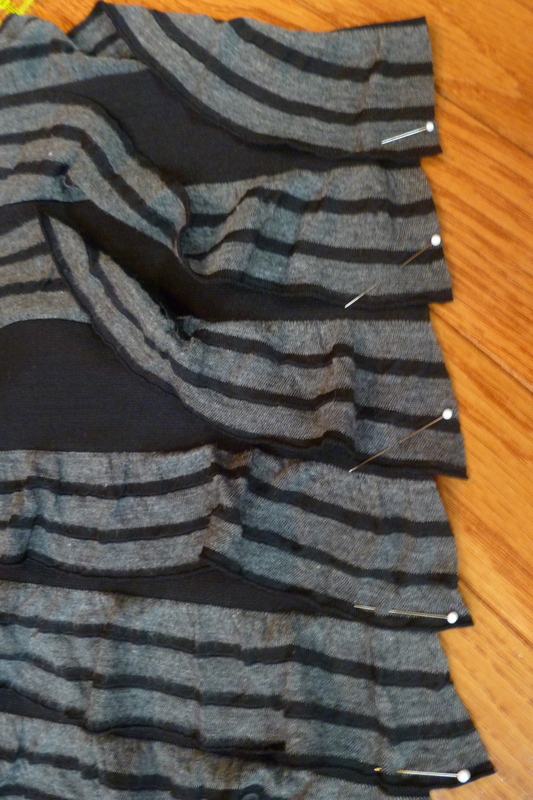 Pin the elastic to the shirt at the center markings. 8. 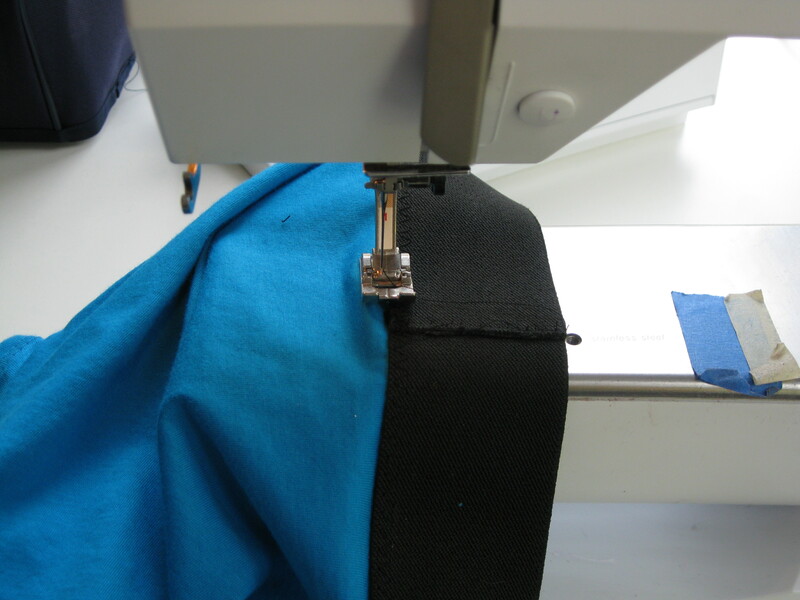 Sew the elastic to the shirt, stretching slightly if the top and elastic are not the same size. 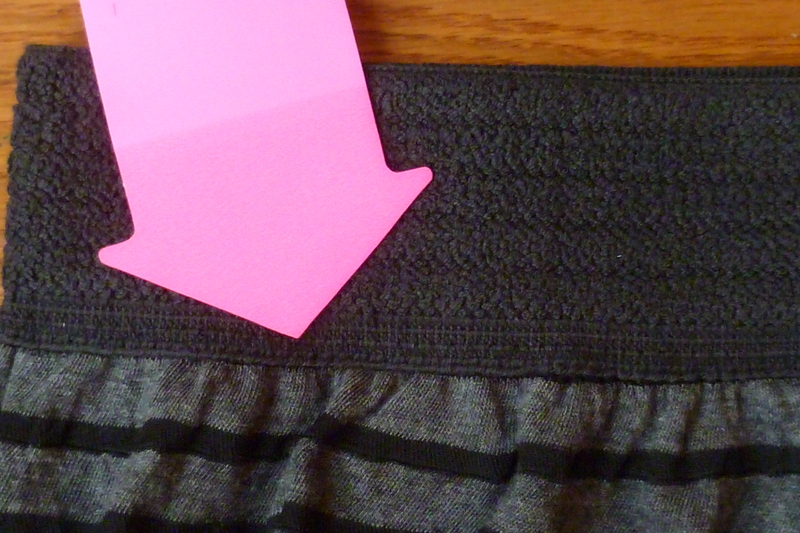 A zig-zag stitch works well for this. On my first attempt, I tried a cover-stitch but it didn’t work well. Admittedly, I’m rather new to cover-stitching so maybe that was the problem. 9. 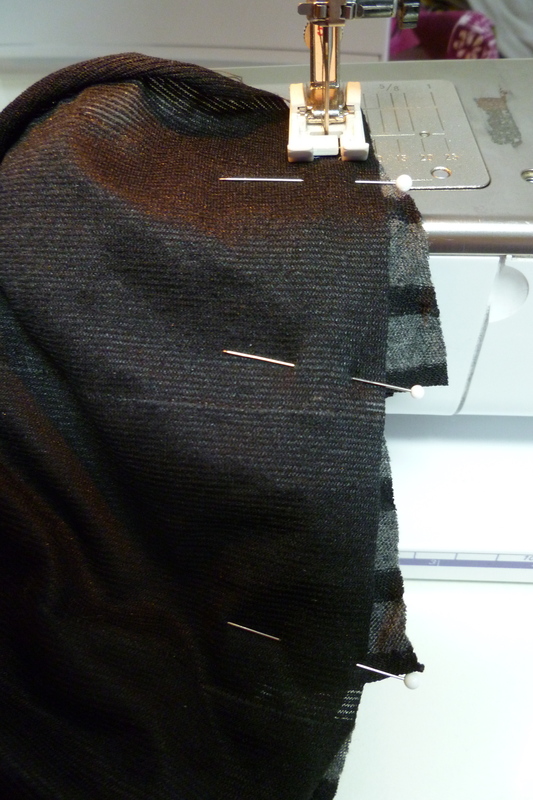 Now repeat this process to attach the skirt. (Your eyes aren’t fooling you – the black colors are different from one another). 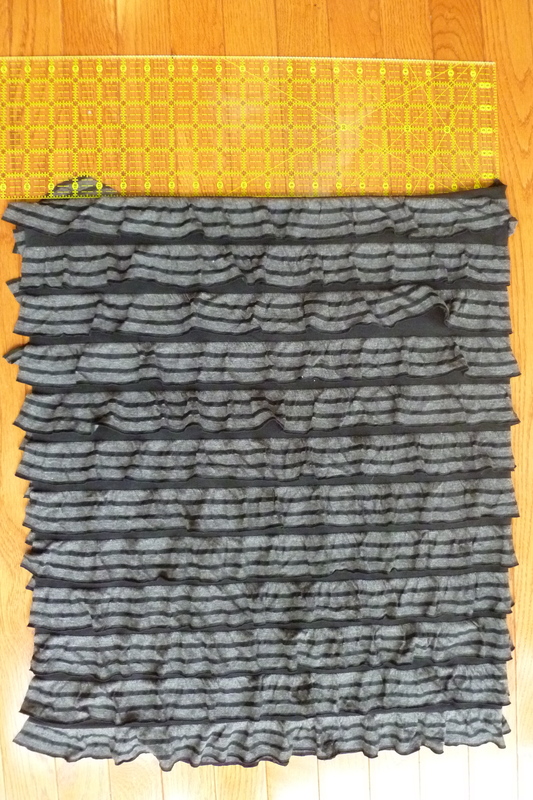 I’ll do a later post on how to make this skirt as I need to think about how to describe it before I can do a tutorial. 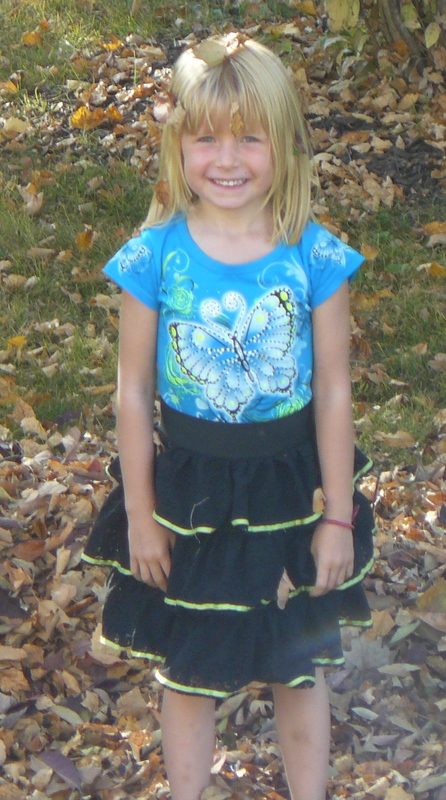 The dress was a huge hit, as I anticipated. 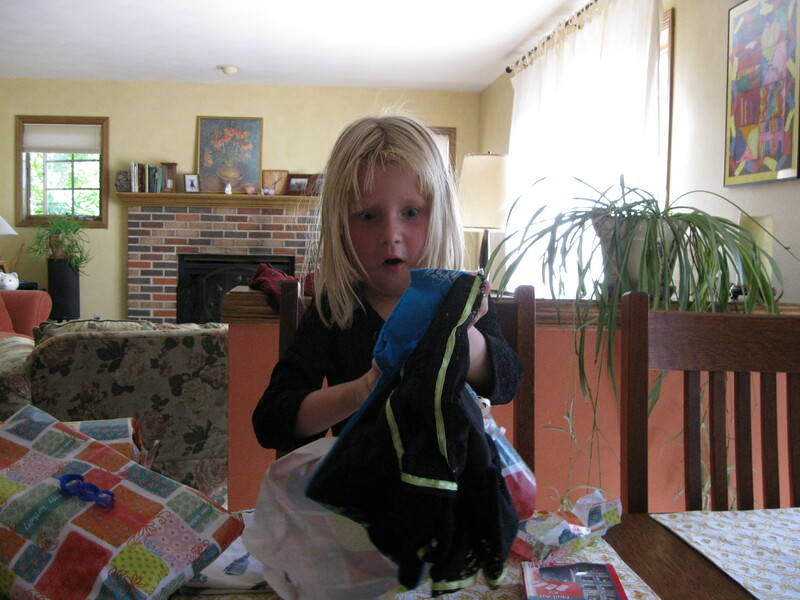 It was for Cate’s birthday and she wore it for the entire weekend; she even slept in it one night. The obvious is that I’d try to get the blacks a little closer. Also, this dress just fits so I would have preferred it a little larger. In this case the 100% cotton t-shirt was 2″ larger than Caitlin’s chest measurement – would go for a larger size the next time. Other than that, I’d do it the same the next time. What a fun dress. 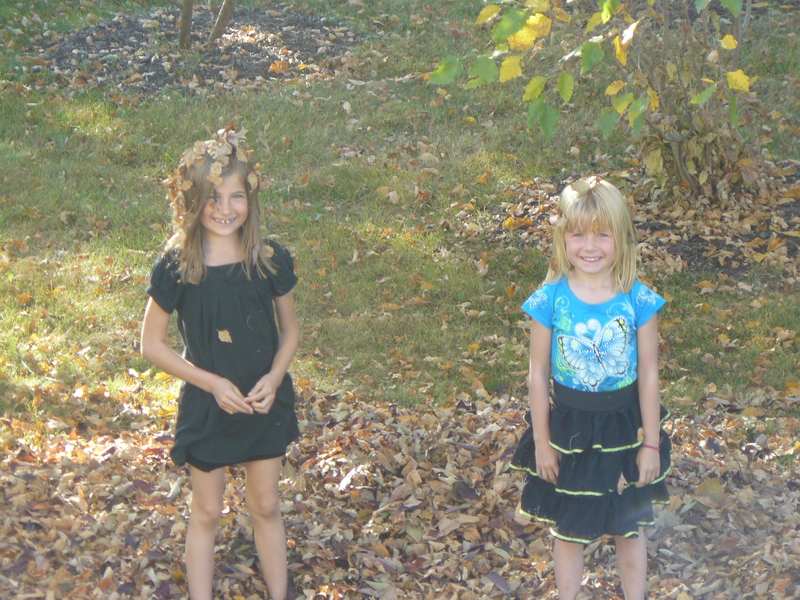 Now I need to make a similar one for her big sister.